CLP Power introduce green technology in Island. Transfer electricity to the islands had long been a problem for the engineers in power plants. Neither using submarine cables nor overhead lines would be practical for the electricity supply to the island. Using an overhead line would damage the sea view, but using submarine cable would damage coral in the sea. However building wind and solar power facilities can be a good alternative now. CLP Power is a good example on this ecology friendly technology. 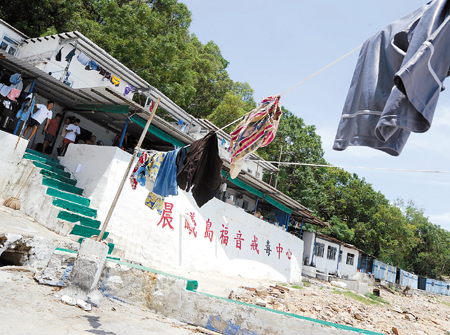 The Dawn Island Drug Treatment and Rehabilitation Centre located in Town Island, southern tip of Sai Kung, and using generators for electricity supply for years. However it is not effective and do harm to the environment. The generators emitted carbon dioxide while operating. At the same time they often break down, and the Centre needs to stop electricity for many times a day. 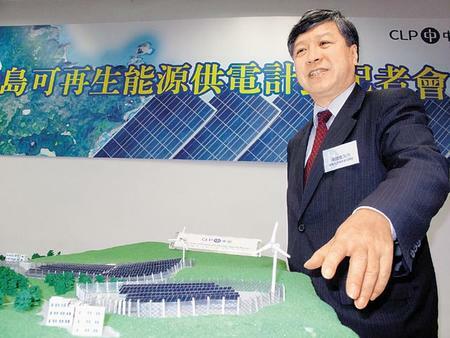 The CLP Power therefore will build wind and solar power facilities to replace the generators, and the Dawn Island Drug Treatment and Rehabilitation Centre will become the first location in Hong Kong powered entirely by renewable energy. Drug Treatment and Rehabilitation Centre will become first location in Hong Kong powered entirely by renewable energy. After the install of solar plants and wind turbines, they will provide 192kW of electricity which enough to run about 200 air conditioners. At the same time, carbon dioxide emissions will be reduced by 70 tonnes a year, and the electricity generated can be used in hostels, visitors’ centre and other facilities. This is a good example for us to follow, and will give us valuable experience on green energy development. For now there is a small rehabilitation centre powered by renewable energy, how about a New Territory village later on? If the scale increased, we can have a whole district powered by renewable energy, and reduce carbon dioxide emissions dramatically. Let’s support more green energy proposal just like the Dawn Island one. The world is struggling to reduce the carbon emissions that some blame for climate change. Industrialised and developing nations disagree on responsibility, and only a handful of countries are meeting targets outlined by the Kyoto Protocol. The outlook for a successor pact to be agreed to at a summit in Copenhagen in December is looking increasingly bleak. For those fearful of global warming, there would be less cause for gloom if nuclear power was embraced. Most of the world’s electricity is produced by fossil fuels. This accounts for the bulk of carbon emissions from human activity. Nuclear reactors are the most reliable way of generating power with minimal environmental impact. The amounts of uranium for fuel and the waste that has to be dealt with at a reactor can be up to one million times smaller than at an equivalent-sized coal-, oil- or natural-gas-fuelled power station. China and India are among the few nations to push ahead with reactor programmes. They have concluded that it is wrong to hold back nuclear power on health and safety grounds – the reasons stalling programmes in many other countries. Modern reactors are much safer than the ones that caused accidents at Three Mile Island in the US in 1979 and Chernobyl in Ukraine in 1986. Nuclear power, when managed properly, is not dangerous. France, Sweden and other countries with well-developed programmes prove this. Nations reluctant to use nuclear energy have turned to hydro-electric, solar, wind and tidal power. These options are even cleaner than nuclear, but each is limited by environmental considerations or reliability. Technology may yet change this and better alternatives may be developed. Until that time, though, the challenge of climate change demands they be used in conjunction with reactors. Two-thirds of the reactors being built in the world are on the mainland. It is operating 11, constructing 14 and work will start soon on 10 more. Just 1.1 per cent of electricity comes from the plants, but that is expected to at least double by 2020. About 80 per cent of power is generated by coal, the most environmentally damaging fossil fuel. The economic loss due to the pollution is estimated by the World Bank at 6 per cent of gross domestic product. President Hu Jintao told the UN climate change summit in New York last month that China would cut carbon dioxide emissions by a “notable margin” by 2020, compared to 2005 levels. But he did not set targets. Efforts to reduce reliance on fossil fuels were under way and would continue, he said, but industrialised countries were largely responsible for global warming and should provide the bulk of technology and expertise to tackle it. The line is consistent among developing nations: economic growth must not be sacrificed. Hong Kong and the developed world have high-energy lifestyles; we are wedded to air conditioning, large infrastructure projects and overseas travel. Behaviour must be modified, but to give up what has been achieved is unrealistic. The agreement signed last Tuesday between Hong Kong-based CLP Power (SEHK: 0002) and China Guangdong Nuclear Power Group, extending the supply of nuclear electricity from the Daya Bay plant to May 2034, sets the right tone, providing our city with clean, reusable and sustainable energy. Nuclear reactors are expensive to build and decommission. For now, though, there is no better way to generate electricity and reduce carbon emissions. Attitudes have to change. It is inconceivable that the modern world will turn its back on energy-intensive living. Nuclear power is a proven alternative.